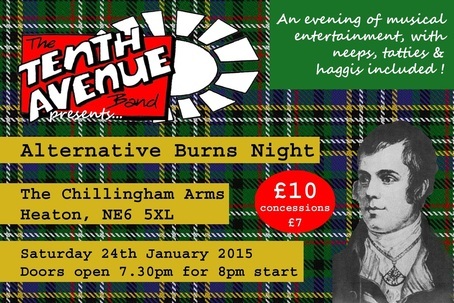 Tenth Avenue Band is delighted to invite you to Alternative Burns Night 2015 at the Chillingham in Heaton, Newcastle. This year's extravaganza will be on Saturday 24th January. Doors open at 7.30pm for an 8pm start and the event will run until around 11pm. Tickets cost £10 for adults, £7 for children and concessions, payable on the door. The ticket price includes an evening of musical entertainment, haggis, neeps and tatties (including veggie alternative) followed by cheese and biscuits. Tickets are limited, so if you would like to join us please fill out the online booking form to let us know you're coming. Tickets will be allocated on a first-come first-served basis.